S. Craig Zahler has made a name for himself for directing gritty and brutal films that straddle the line between genre pieces and outright exploitation. His filmography is filled with gore, violence, and a bevvy of despicable reprobates, often placed into the driver seat of the narrative as the protagonist, putting the viewer into the uncomfortable position of rooting for an unsavory character. Zahler's work has been described as "neo-grindhouse" by some and because he leans into the elements that define that genre, his movies also pick up some of the more problematic elements that come with that territory. 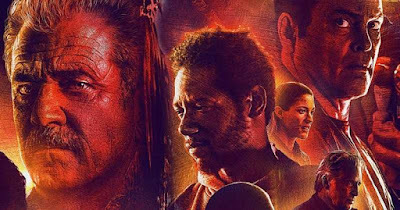 Dragged Across Concrete (2019) is both a departure from Zahler's style and an evolution of some of his stylistic quirks. The story centers around two corrupt cops: Brett Ridgmen (Mel Gibson) and Anthony Lurasetti (Vince Vaughn). After a particularly roughly handled drug bust goes viral, both cops are suspended without pay due to negative media attention. Down and out and lacking money, Brett and Anthony decide to take matters into their own hands and use their connections in the criminal underworld to score some funds. Both Brett and Anthony are racist individuals and this film does not shy away from that portrayal. Depiction doesn't always mean endorsement, and it doesn't feel like Dragged Across Concrete is glorifying this behavior. I think it is a disservice to portray racists as cartoonish villains because in real life this behavior is much more subversive. Your local racist most likely isn't going to be covered in swastikas or wearing a KKK outfit, it's the cop that uses racial slurs behind closed doors and profiles individuals, or your brother-in-law who forwards you racist email chains. While both of these characters have families and people they love (and in the case of Anthony, a black girlfriend), in the bigger scheme of things they are still negatively defined by their ideology. One of the reasons that Zahler's films rub people the wrong way is the fact that his stories don't have a "statement" about race relations, they just have terrible people going terrible things. These people usually have a few good aspects as well, so it’s a little more complex. This movie actually does make a point with a character’s ideology costing him dearly which is more than I can say for his other films. The fact that Zahler leaning into the grindhouse aesthetic is most likely what is making his films so nihilistic, because those types of films typically aren’t interested in making any sort of moral statement or idea. Tory Kittles puts in a compelling performance as a black ex-con named John who is trying to make a better life for his drug addicted mother and his little brother who is extremely bright and confined to a wheelchair. 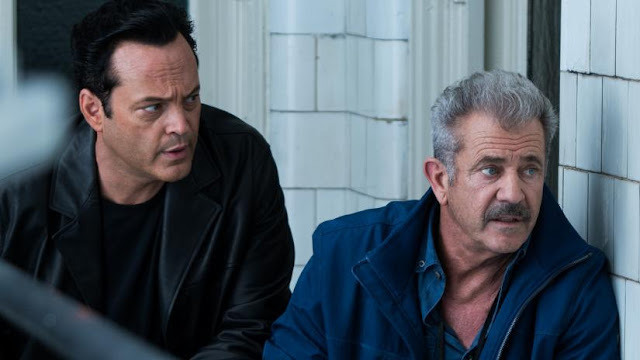 Out of all the characters in Dragged Across Concrete, John is the only one with an internal sense of morality and though he may have committed crimes in the past, his attempts at bettering the lives of his family are commendable. Kittles has a lot of great interactions with his partner Biscuit (Michael Jai White) and I was rooting for them to make it out of the dire situation more than Brett and Anthony. Dragged Across Concrete is Zahler's longest film yet, and unfortunately after a strong first act the pacing sags quite a bit in the middle. The idea of pretty much sitting in on a stakeout in real time sounds great on paper, but in execution it's just not as compelling as it could be. The pace picks up in the third act and the finale, which takes place in a dusty yellow-tinted boondocks, is absolutely gripping. This is where Zahler shines, in his pulse-pounding action scenes and use of irony. Mel Gibson, as abhorrent as his real life persona my be, is excellent and perhaps his notoriety adds to his performance. While this doesn't feel like one of Zahler's most focused outings, it does feel like he's branching out and trying to inject his stories with more nuance and gravitas, and on that front this film is successful. Those who aren't a fan of his work already probably won't be persuaded by this new one, but it definitely feels like he is expanding his reach.